Since we came back in the area, I have wanted to visit some of the older folks I have known ever since I was a child. Most of these are now very elderly, and I haven’t seen them for years. But i used to see them very often, some of them daily when I was growing up. I used to go to their farm, or to help with the grape harvest. One is a widower. Things have changed, but these folks are still around. During the holiday, we went to see an older farmer. He used to be our landlord, and next door neighbour. We used to go and get milk daily at the farm. he retired a long time ago and his son has given up farming, but he is still there. We just turned up after going for a walk. I introduced myself and he gave us a very warm welcome. It was great to see him. As we were there, some other visitors came and went. On Friday, I went to visit another elderly couple. I was on my own this time, and did the same as I always used to do: turn up at the door, no need to warn you are coming. These people are like that. If they are around, they will stop what they are doing and offer you a cup of coffee and biscuits. We had a good time. Again, some people turned up when I was there. One was an elderly woman who was the grandmother of some school friends. There’s at least one more person I want to go and see before going back and see the other ones. The village has changed, most local folks are now diluted amongst the newcomers, but they are still there. you just need to know where to look. The local council is organizing meetings in various parts of the town to share some of their projects, but also meet the citizens and answer some of their questions. I was able to go to the one organized in the town hall on Saturday morning. The most interesting part of the meeting was listening to the various people’s concerns and questions. Most were elderly folks. I was one of the younger ones. Their main concern was a feeling of insecurity. There are a few young people creating trouble around. Some garages and basements are regularly broken in, and they are noisy at night. It is a pain, and a very real problem, but as people talked, I realized that one reason for these is that there probably has never been any communication with these young people when they were children. If those older folks had shown interest in these young people and their families when they were children 15 or 20 years ago, maybe they could go and talk with them, and the situation would be easier. Someone gave an interesting testimony. He had seen an older gentleman running after some young people, accusing them to have stolen his bike. He went to talk with them and explained that the man needed his bicycle, and that if they knew who had stolen the bike, they should give it back before the man goes to the police. One hour later, the bicycle was back. But folks here are quite cold. I can say that because I am a local. People keep to themselves and a narrow circle of friends. They hardly know each other. They don’t talk to strangers. They don’t welcome new folks. While we were in Brittany, we felt we had a warm welcome from the local population. It took a few months, but after a while, it got easier and people were more open. Here, the only people who have welcomed us and who have come to talk to us are ‘strangers’. They come from other parts of France. We are not unique. I was sharing about this with the headmistress recently. She is also from another region. She has also found that most of the people they have come to know as a family are not locals. Strange hey? No wonder a number of young people create trouble. Nobody ever showed interest in them in the first place. 11th November is always a bank holiday in France. We remember the end of World War One. 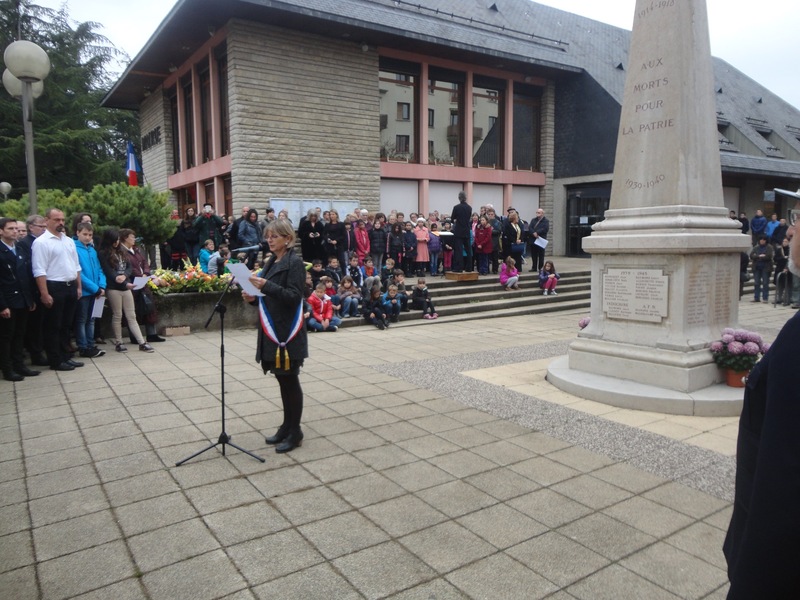 In every town and village, there is a civil ceremony at the war memorial. I never used to go to the ceremony but in recent years, I’ve made a point to be there with the family. I was impressed by the number of people who had turned up in Cognin on Tuesday. There were between 200 and 300 people I would say, maybe a bit more. The ceremonies are the same everywhere, but there is one thing I noticed. A choice sang the Savoy national anthem “les Allobroges”. I had never heard it before. I don’t recall hearing the Bro Gozh in Brittany though. Why is that? I wonder. Anyway, it was a good ceremony. Jean-Baptiste and Maxime took part and put candles at the feet of the monument when asked. The ceremony was followed by an aperitif. It was an opportunity to chat with the school headmistress and get to know her better. Since we can’t go to the Roudourou stadium in Guingamp anymore, I had told Jean-Baptiste we would go and see them play in Lyon and Annecy. So last Sunday, we were in Lyon for one of the big games of the year. The stadium was packed. We found the visitors entrance fairly easily and were among the first ones to arrive. Some joined us later. 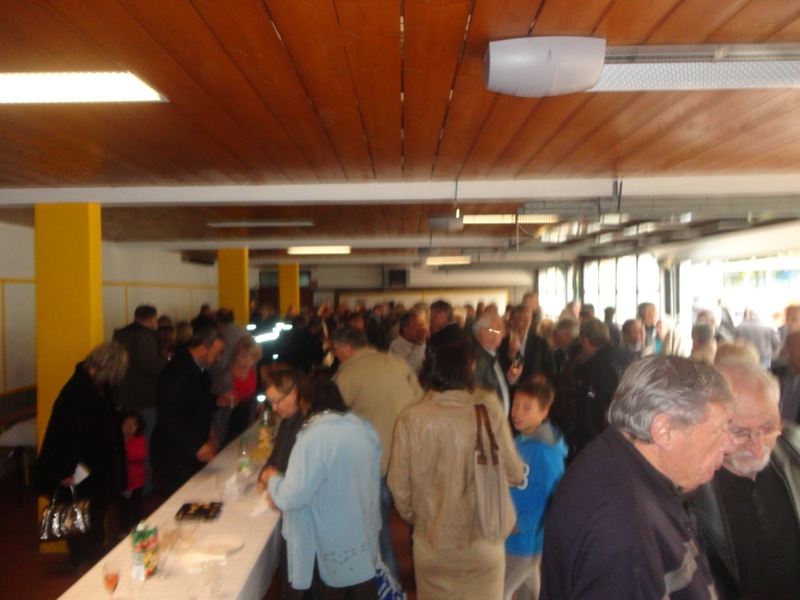 There were about 100 of us, most of us had come all the way from Brittany, but a fair number were from the region. It was good fun. We lost, but we had a great time with Guingamp supporters, singing and supporting the team. At the end of the game, it was a new experience for us. We had to stay in until the stadium was empty before we could leave the place. We went back to the tube under the rain, queued with everyone else, but by the time we got into the tube, most people had gone. We met a few other Guingamp supporters who had made the journey especially from a village near Guingamp for the event. We arrived home safely after an uneventful train journey. On Sunday, I was in Lyon with my two older boys. We were there for the football match: Lyon vs Guingamp. Kick off being at 2pm, we left early so that we could be in church in the morning. I wanted the closest church to the train station for easy access, but also to get to the stadium quickly at the end of the service. We found the church easily. They meet in what was probably a shop. There is a big window and people walking past it can see what’s going on inside. That is great as there was a market up the road, and some shops were open in the street. 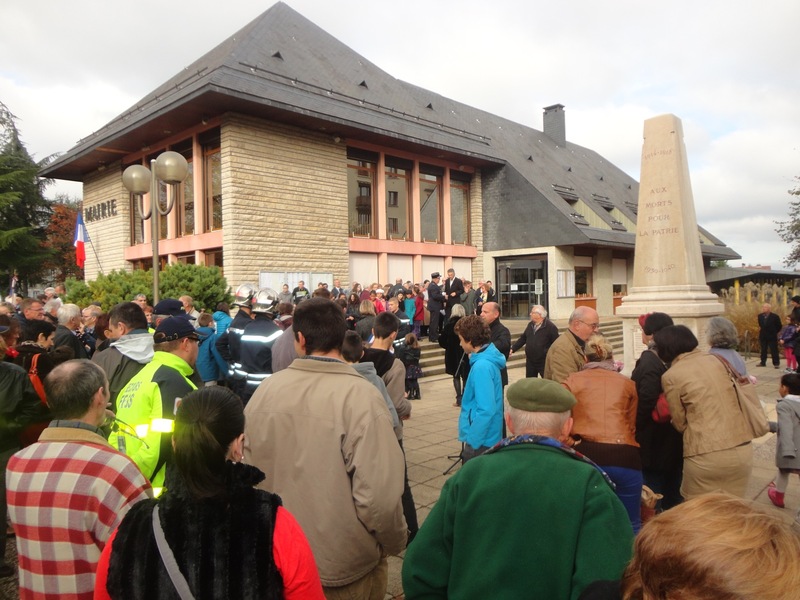 Many people walked past the church during the service. We had a warm welcome. We were there early, and the pastor welcomed us, as well as a Korean missionary. People arrived slowly. It is a small work, but I was struck by the diversity. It is a Korean church plant by the JDM (Jesus Disciple Movement). So there were Koreans. But there were some French and Cambodians too, as well as two black men. The service was straightforward, and I enjoyed the sermon from Acts 13. If you are looking for a church in Lyon, there is no doubt you’ll be warmly welcomed there. Most people don’t like public transport. They would rather be on their own in their car, stuck in a traffic jam, rather than crushed in a smelly bus. But I like public transport. Apart from the fact that there is no need to find a parking space in town, it is a good place to observe people from all sorts of backgrounds. Some things struck me recently both in Chambéry and Aix-En-Provence. First is that some people are willing to have a chat while waiting for the bus. I recently had a long chat with an elderly from a village near Cognin. She knew my home village very well. Her daughter lives near my mum and she knows some of my mum’s neighbours. This morning also, I had a quick chat with a man while waiting for a bus in Aix-en-Provence. It didn’t go far, but he was willing to chat. What struck me also is that I noticed young and older men actually stand up to let women and elderly folks sit. Also, when you leave a French bus, you thank the driver and say goodbye aloud, even if the bus is packed and the driver can’t hear you. It is probably not true everywhere, but it is true where I have been so far.